History of UKULELE Music - You Can Get in on the Fun Too! Instrumental ukulele music is on the verge of becoming just as popular as mainstream ukulele music is. People are finally starting to realize that the ukulele is capable of making very good music. This instrument has been around since 1879 and it is just now being realized how it can make such enjoyable quality music. When the ukulele has first invented the Hawaiians were not impressed with the beautiful music that the instrument was capable of making. It wasn't until around 1915 that the ukulele popularity came over to the mainland. It was after that the craze of the ukulele began which raised the popularity of the instrument. No matter what the history is behind it, the ukulele is now Hawaii's most popular musical instrument. There was a great demand for ukuleles, which meant that production had to increase substantially. Of the original creators, by 1910, only one of them remained and he couldn't keep up with the demand. New competitors entered the field after time offering unique designs. Although there was a great deal of competition, there were still enough orders that each business was still being flooded. The competition took a turn when the mainland guitar manufactures started making ukuleles around 1915. The Hawaiians where angry when it was learned the mainland manufactures started stamping "Made in Hawaii" on their Ukuleles. The Hawaiian ukulele makers created an original stamp that the legislature backed. Sometime in the 1920's, mainland makers started mass-producing the ukulele. Today we are seeing surges of ukulele music popularity coming back. Hawaii is home to many musicians who have devoted their lives to playing the music of the ukulele. The ukulele is very light and also very portable which means that it makes it very easy to practice it. Even though ukulele music has been around for over 130 years and it is still a very popular musical instrument choice. The music has a lot of history behind it but no matter what the history is, it is now a very popular instrument in world-wide. Even now the demand of ukuleles is growing in South America and other unexpected places. The ukulele is the little brother of the guitar family and is usually seen with four nylon strings. The volume and tone of the instrument depend solely on the size that it is. They come in four different sizes and are enjoyed by countless individuals all over the world. The three smaller ukulele sizes are the soprano, concert, and tenor, and are tuned to the Key of C with the reentrant "my dog has fleas" tuning. The largest ukulele, the baritone is tuned to the Key of G like a guitar and the baritone ukulele is tuned exactly as the 4 smallest strings of a guitar. All guitar players can immediately play the baritone ukulele, although they may not know it. If you are looking for a really fun instrument to learn, you do well to find a ukulele. There is a world of fun you can have with a ukulele. You don't have to be a musician. You do not need any special musical talent. We know this is true because we have been around ukulele folks for over 20 years now. We have repaired ukuleles, hunted ukulele parts, made banjo ukuleles for several years. And now we try to seek out ukulele items that are quality and worth their cost. And certainly, we will help you if we can. The ukulele is a very small guitar that originated from an island in Portugal called Madeira. This instrument was called "braguinha" in Portuguese. In 1879, travelers took a ship from the island of Madeira to Hawaii. Craftsmen who witnessed this instrument being played was fascinated and began producing it for Hawaiians. The instrument was nicknamed "ukulele," which actually means, "jumping flea." It is also called "uke" for short. Ukes are different from guitars in several ways. They are usually very lightweight and easy to carry. Original style ukes are easier to learn to play because they have fewer strings. They are also easier on the fingers. Ukes are, however, limited in the range of notes that can be played. They are great for musicians who want simplicity! Today this instrument is still very popular in Hawaii and is being shipped to music lovers around the world. Let's take a look at the types and styles of ukuleles. 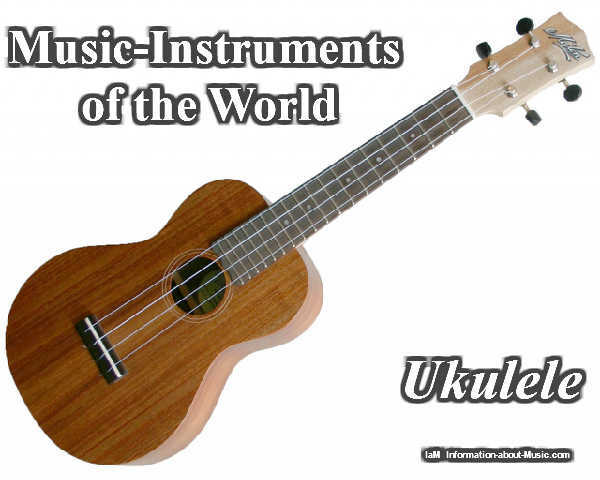 There are four standard types of ukuleles, which are concert, soprano, tenor, and baritone. The most commonly used type is the soprano ukulele. Each type, except the baritone, is tuned using the well-known tune/phrase "my dog has fleas!" This involves hitting the keys G, C, E and then A. The tenor type is one octave down from the soprano. The baritone's tuning is accomplished using this order of keys: E, B, G, D.
There are also hybrid ukuleles being produced today, such as the banjulele (banjo body), taropatch (eight-stringed instrument) and ukelin. These specialty instruments are usually developed by individuals or specialty musical instrument companies. Some are even highly collectible today. The soprano uke is the smallest at about 21 inches long. The concert uke is about 23 inches long. The baritone uke is 30 inches long, and the tenor uke is 26 inches long. The baritone and tenor ukes are more similar to regular-sized guitars, only with just four strings. Ukuleles may also come in a variety of styles, colors, and shapes to reflect the personality of the musician. Some examples of style variety are the Bushman ukuleles, which come in styles such as Jenny Soprano, Jenny Pineapple, Jenny Concert, Jenny Tenor, and Jenny Baritone. A ukulele maker might use a variety of high-quality woods to produce the instruments such as Mahogany to give the instrument a brilliant finish. The shapes of the instrument may vary as well. Some resemble the regular guitar shape while others might be completely oval-shaped, similar to a pineapple shape, or have a piece "cut away" at the neck. With prices ranging from $169 and up, anyone can own a ukulele. They can be ordered online for music fans that live in areas where the ukulele is not readily available locally. There is also a wide variety of ukulele strings and accessories such as felt picks, tuners, amplifiers, shoulder straps, strap buttons, tuning machines, ukulele humidifiers, and more. Whether one wants a cheap ukulele to keep around the house for fun or an expensive one for professional concerts, it's easy to find just the right style online.